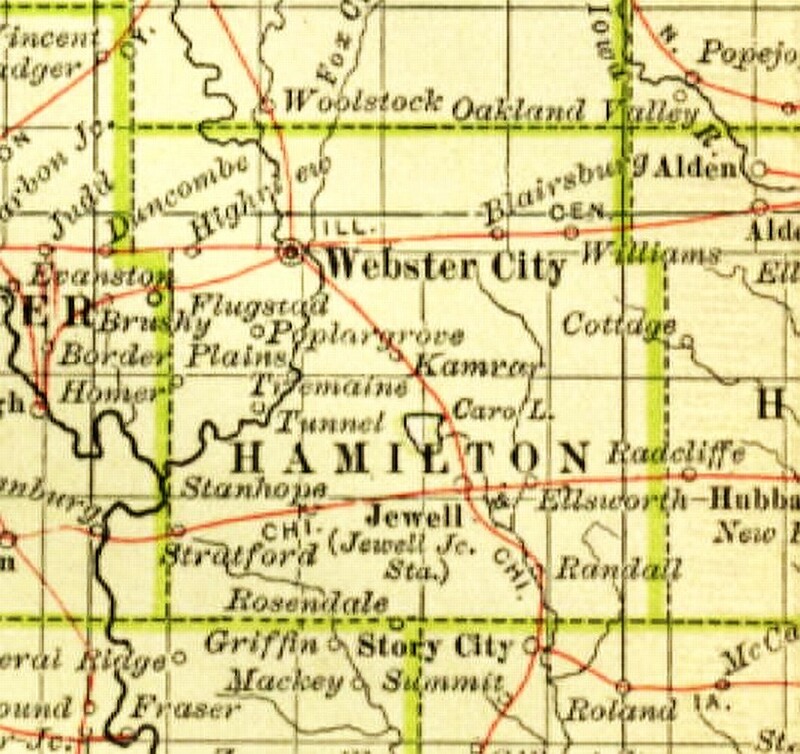 Hamilton County was a part of Webster County from 1852 until December of 1856. In April of that year, an election moved the county seat from Homer to Ft. 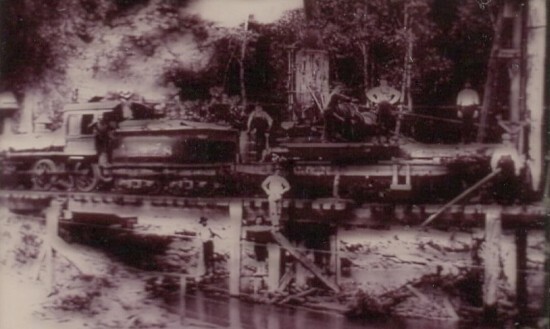 Dodge, which was rebuilt around a neglected Army Post, and by 1856, a thriving settlement was recorded. This also drew Newcastle into the picture as a potential county seat. 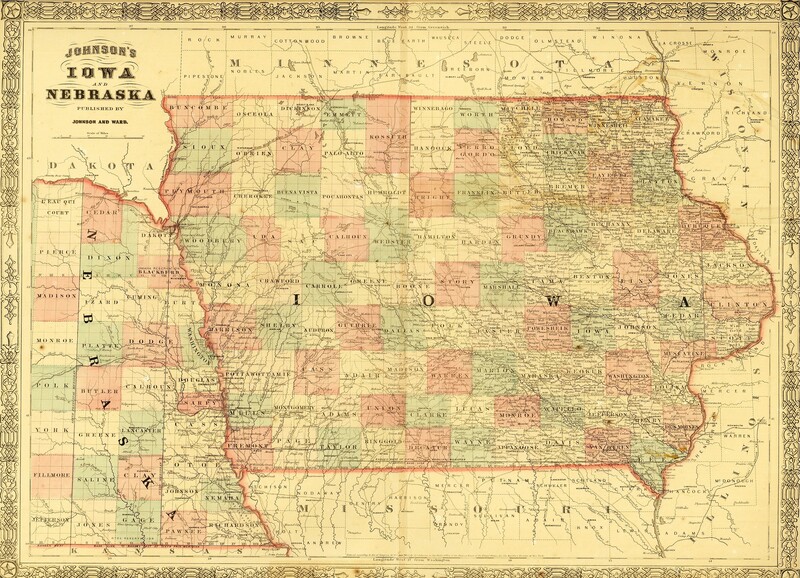 The election of 1856 elected W. C. Wilson as state representiative to sit in the Legislature at Iowa City. He traveled by mule to Marengo and then by stage coach to Iowa City. At that session, he introducted a bill asking that the eastern half of Webster County be made into a new county. At that time, Col. M. M. Hamilton was President of the Senate and he supported the movement, so in 1856 the legislature passed the bill creating the new county of Hamilton, so named in appreciation for Col. Hamilton's support. The population was then listed as 100, and W. C. Wilson at that session designated the county seat as Webster City, instead of New Castle. When the government established a post office there, it became officially known as Webster City, and New Castle was no longer recognized. 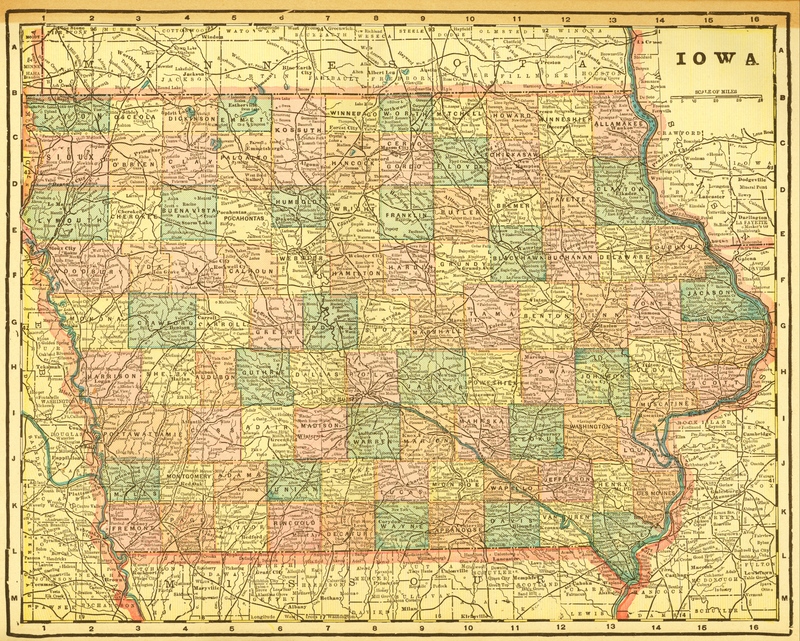 Before 1850, the counties in Iowa were created as the settlers came. 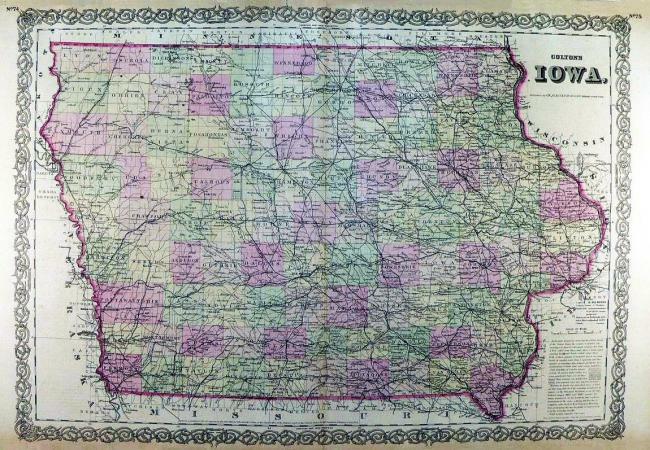 Boone County was established before 1850 and took care of the needs of the few settlers in the area. 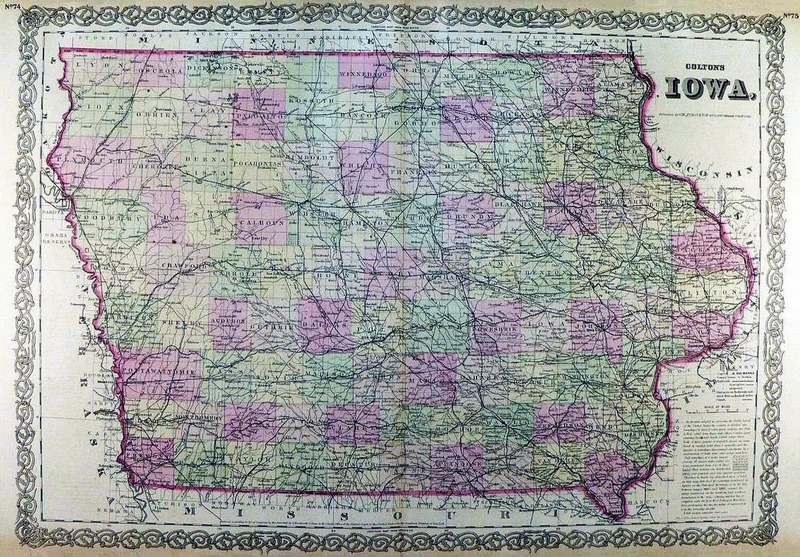 The state legislature in 1850 created two new counties north of Boone County. The west county was named Yell, and the neighbor to the east was named Risley, both named for captains in the Spanish-American War. There were fewer than 12 families in both counties at the time. There were no towns or settlements in the area before 1850. After Henry Lott came in 1847, we find that the Bell family came to settle Bellville. In 1849 one son, Presley Bell, followed the Boone River and became the first person to settle in our county. His grave marker is located in the southwest corner of the Homer Cemetery, but he left the area and moved to Kansas before he died. Osborne Brannon came in the summer of 1849 and settled near Bell's claim in what is now Webster Township. He was the second settler. In 1850 Wilson Brewer and his brother-in-law, William Stanley, arrived and moved upstream to stay the winter in Hope Hollow, the area just 200 yards north of what we now call Bone's Mill. They stayed until the next year and moved on up to a horseshoe bend in the Boone River to settle in a town that Brewer called Newcastle. Their cabin was later restored by grandson, Frank Bonebright, and is a major addition to the Wilson Brewer Park. The Jackson Groves cabin was moved in from the Briggs Woods area and joined onto it. Thomas Hogan and John Tolman were also arrivals in 1850. Isaac Hook came to the county and settled just north of present day Stratford in early 1851. He operated a hotel which became a stopping point for new travellers. He planned to call his hotel "Marion House" and create a town named Marion City. 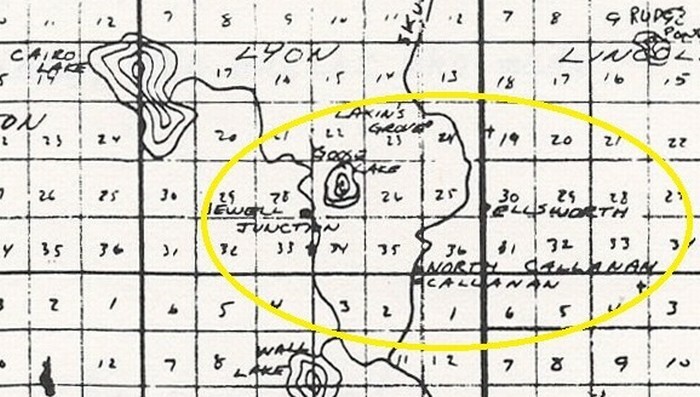 One of the first county roads laid out ran from Marion City to Newcastle. The granite road marker was dug up several years ago and is now located in my flower garden. Hook also operated the first tavern in the county. It was the scene of a dispute over a strip of fence between Charles Gatchell and George Smith after drinking in Hook's tavern. As Smith was leaving the tavern he spotted a loaded rifle leaning beside the door. He picked it up and shot Gatchell in the side. Gatchell died about 25 minutes later from the wound. Smith was later arrested by the sheriff, but there was no jail to hold him so he escaped, never to be seen again. Gatchell was buried in the Hook's Point Cemetery, but some objected to having a murdered man buried there, so he was buried just outside the north fence. In the 1930's Mr. Runkle, editor of the Stanhope Observer, decided to do something about that. Along with help from the Webster County Historical Society, he raised funds and purchased a three-foot-wide strip north of the fence. They then moved the fence, so that today Gatchell is just inside the Hook's Point Cemetery. Many other settlers were now arriving in Risley County. D. S. Jewett, Jacob Crooks, Ed Leastman, James Brock came in the close of 1851. Benjamin Bell and family settled in the Bell's Mill area in 1852. By this time there were some 50 people living in Risley County. Others arriving in 1852 were W. W. McKinney, E. Russell, Andrew Groseclose, John Whaley, Washington Neese, Dan and John DeVore, P.Johnson, David Eckerson, John Cofer, all of whom settled either in Homer or in Hook's Point. The settlers in Newcastle were John N. Maxwell, Patrick Frakes, William Funk, and J. R. Payne. This year also saw the opening of a drygoods store in Hook's Point by Hook and David Carroll. One very important settler, Granville Burkley, came to the area in 1851 and taught school. He was a lawyer, trained in the classics, and saw a real opportunity if he could combine Risley and Yell into one big county. 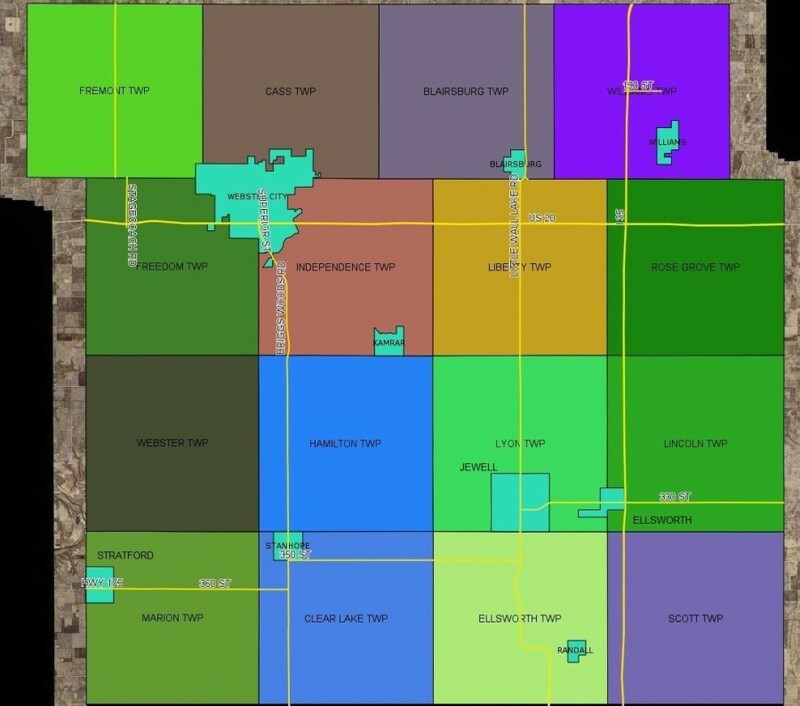 The center of the new county would be about where he was living. During the winter he carried a petition to all settlers, about 15 families by this time, asking for the combining of the two counties into one. It was to be called Webster, for the noted national orator, Daniel Webster. The 1852 legislature passed the act, and Burkley was responsible for the location of the county seat at Homer. Thus the names of Risley and Yell were retired. You may wish to click to enlarge and more clearly read this Hamilton County map. 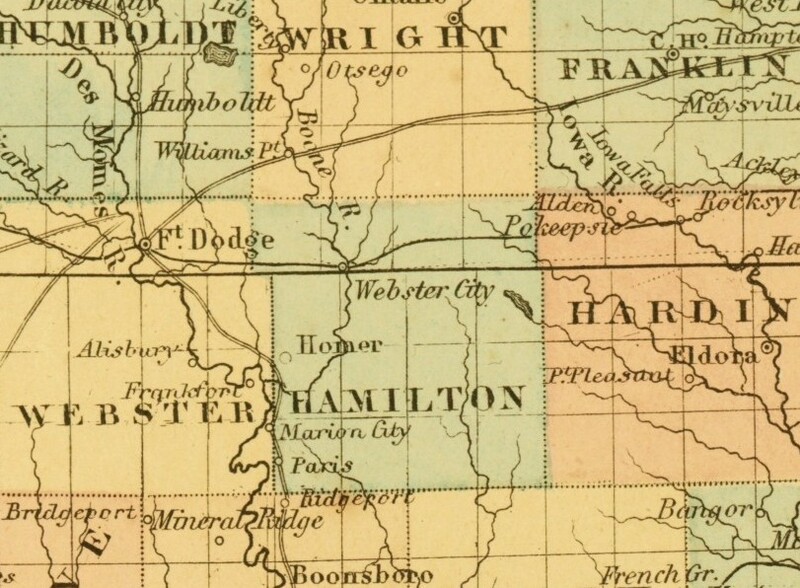 Compiled by Ruby Greiner Nail on a 1858 map showing roads of Hamilton county. Ellworth, Jewell Junction, Lakin's Grove and Callanan are visible. 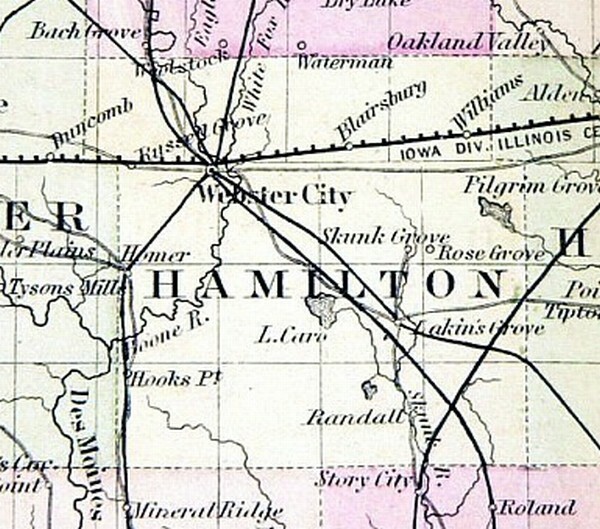 The full map of 1858 showing all of Hamilton County follows. The question is often raised why Webster City was chosen as the name. It might have been a tardy compliment to Webster County, but it is also said that it was to honor a very popular stage driver who drove through the town for several years. 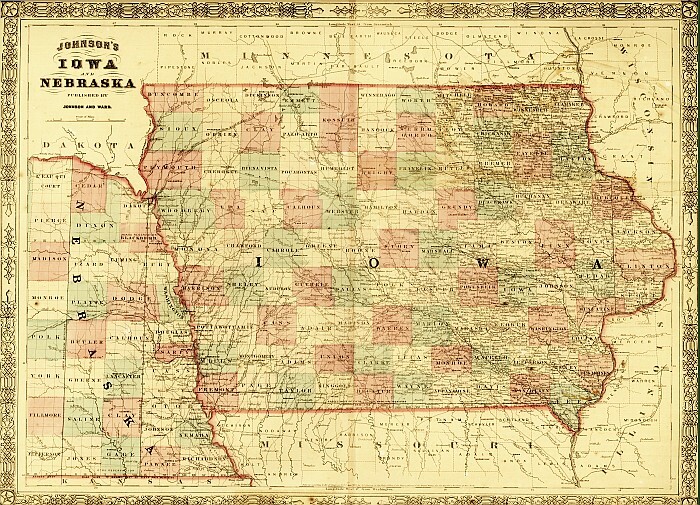 Mr. Wilson was very proud of the results of his labors and in making an address in Des Moines in 1894, he said the county of Hamilton and Webster City were the pride of his life. He became a citizen of Hamilton County, and lived there over 40 years until his death in 1900. 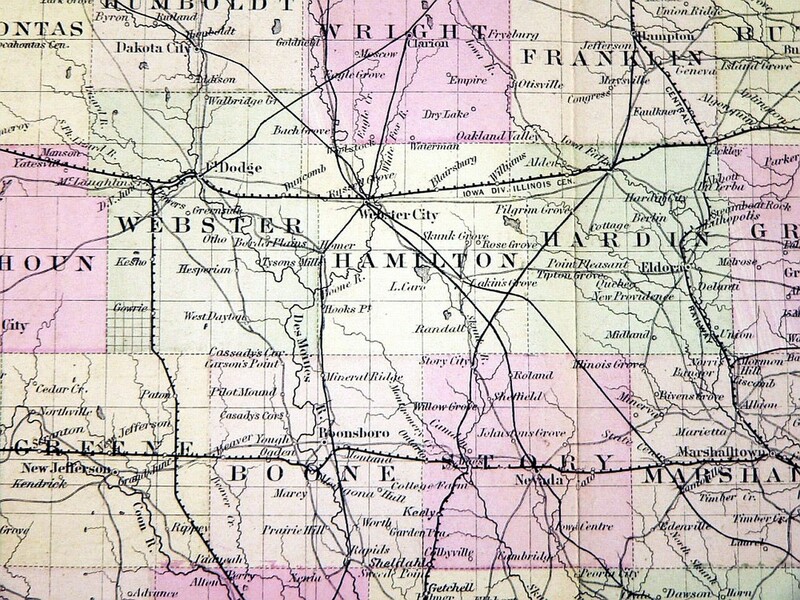 The original Hamilton County of 1856 contained four civil townships. They were Boone, Webster, Hardin, and Clear Lake townships. 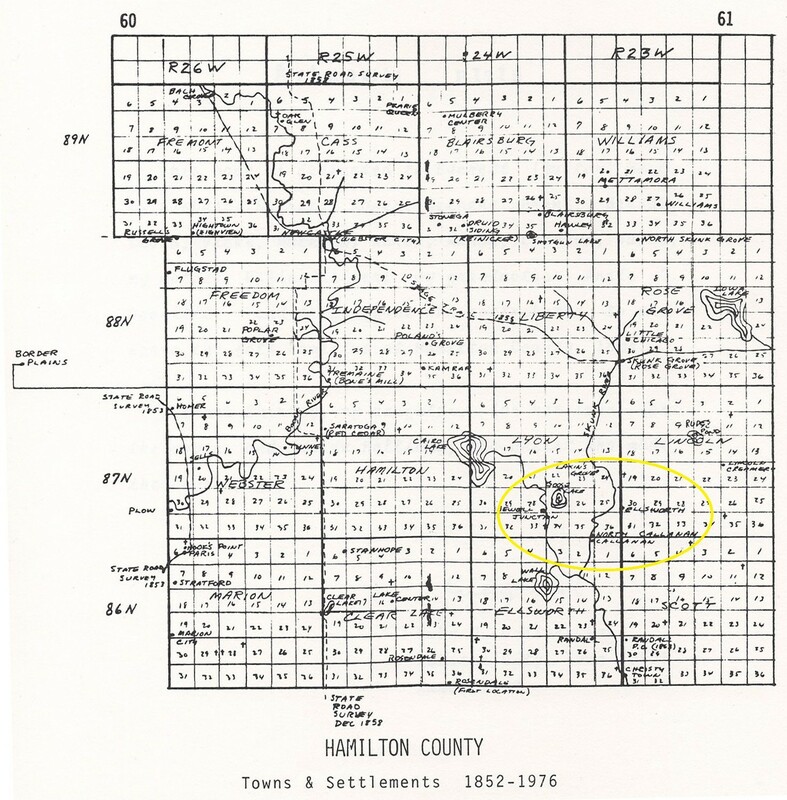 By 1858, Cass township was taken from Boone and by 1860, Hamilton, Marion, and Norway townships were added, making a total of seven. Between 1860 and 1880, sixteen townships were named. Hardin and Norway (part of Scott) were discontinued. 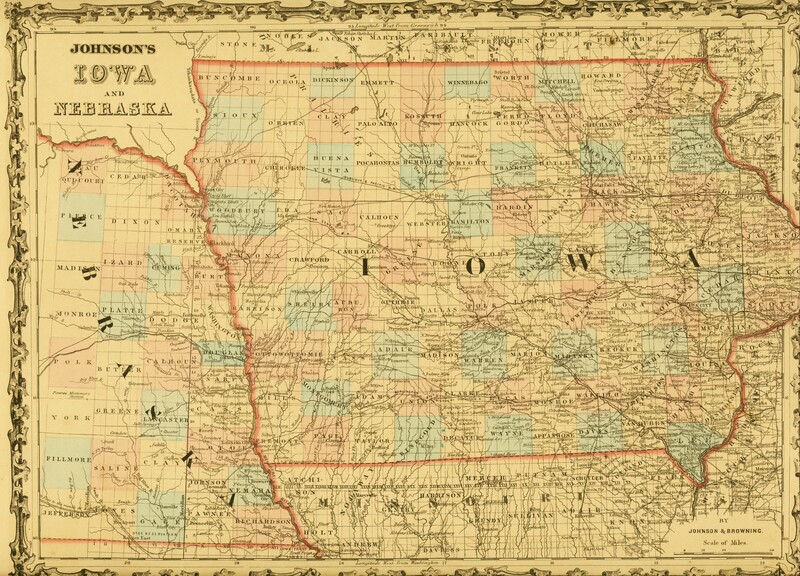 Boone township existed only in name, as its boundries are the same as the corporation limits of Webster City. 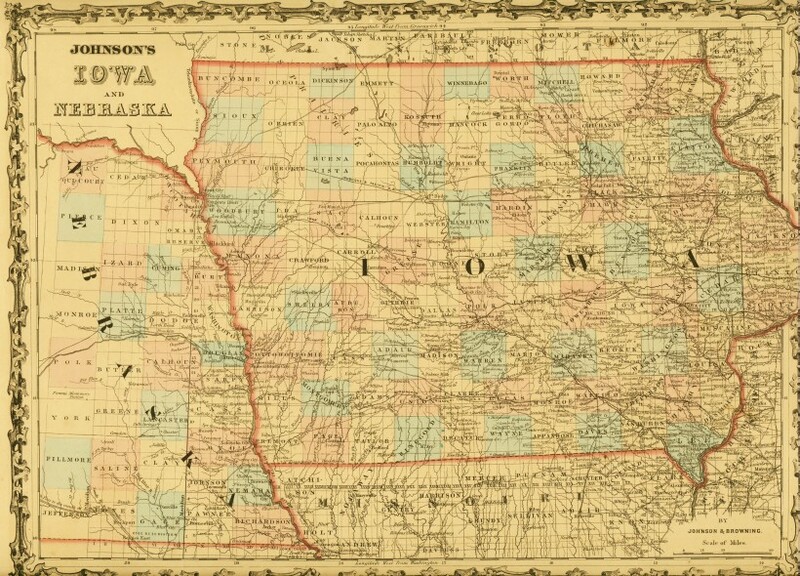 Thus, our permanent sixteen townships were formed namely: Fremont, Cass, Rose Crove, Webster, Blairsburg, Freedom, Williams, Independence, Liberty, Hamilton, Lyon, Lincoln, Marion, Clear Lake, Ellsworth and Scott. 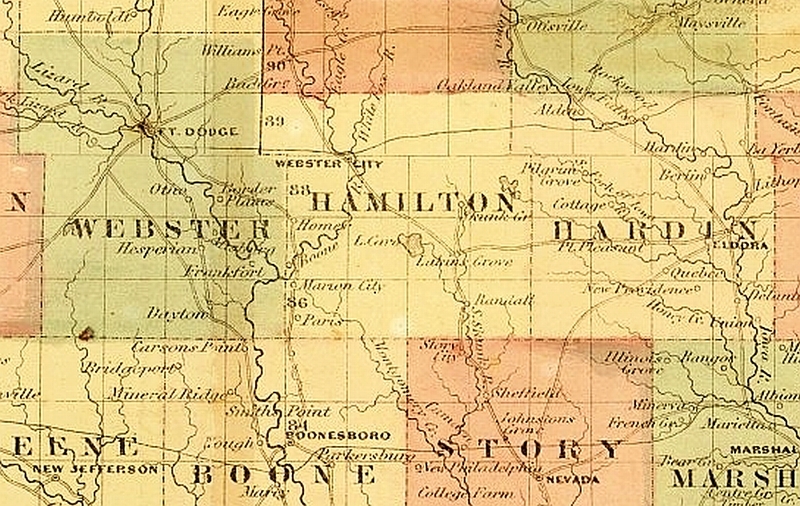 The first Hamilton County election was held April, 1857. Record show 347 votes were cast. Elected were county judge J. D. Maxwell, district clerk W. W. McClure, Prosecuting attorney E. H. Green, treasurer and recorder Cyrus Smith, county assessor R. D. Remington, Sheriff Jw. Royster, school fund commissioner J. W. Paine, coutny surveyor E. Huntington, and drainage commissioner H. M. Barstow. L. Lakin was named coroner. In 1857, the Dubuque Herald listed improved land in Hamilton County at $10 and $15 per acre. Wild prairie land from $3 to $8. Timber land went highter, from $20 to $30, since it was productive for lumber and fuel. 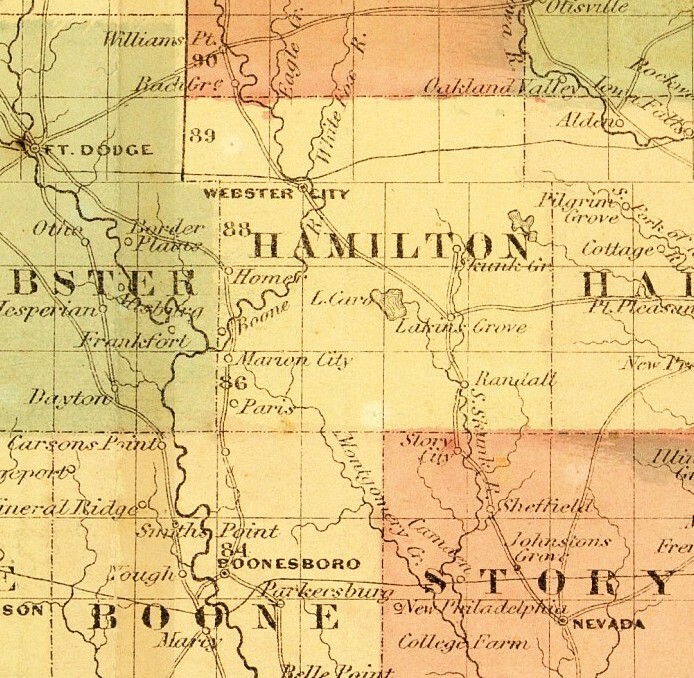 Hamilton County was and still is known to be some of the finest farm land in the United States. 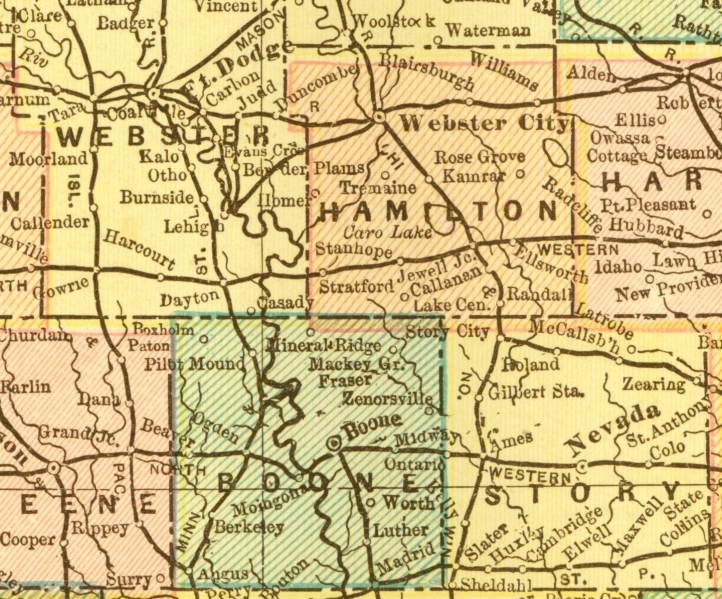 This 1864 Johnson's Map shows Laking's Grove, Homer, Webster City and early settlements of Hamilton County. Boonesboro is seen in Boone County. 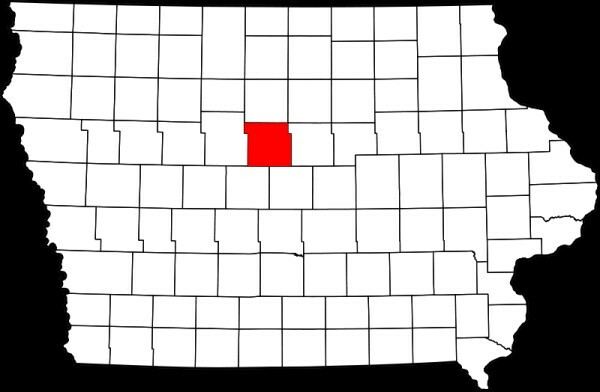 Story City, Nevada, and the Iowa College Farm are seen in Story County. J. W. Lee was county superintendent of schools from 1861 to 1865. Later, he was also a member of the Board of Supervisors, who laid the plans for the first court house in 1876. An attenpt to start a town was made at Callanan. It was meant to serve the townships of Lincoln, Lyon, Ellsworth and Scott. A 5% tax was voted by these four townships to provide a narrow gauge Railroad north from Ames. Accordingly, the town of Callanan began on the east bank of the Skunk River in the northeast corner of Section 2 of Ellsworth township. Callanan was named for the President of the Des Moines and Minneapolis Railroad, as it was called then. The town was to have been named Lakin after the first settler there, but plans were changed. By the Spring of 1878, the narrow gauge railroad was completed to this point. Lee's History states that the grade leading up to the the town had to ascend over such a high bluff that the train would often skid down grade and have to puff back up with great difficulty. Before this condition could be improved, the mortgage on the line was foreclosed and changing the grade was never completed. 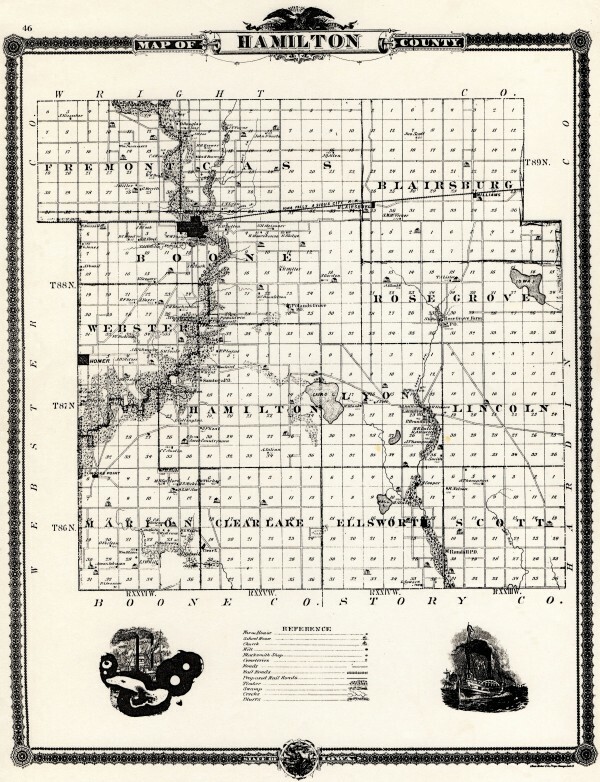 The Northwestern Railroad Company purchased the remains of the line, but were not satisfied to continue with the narrow gauge, so the entire new route was laid out north from Randall, making the stations of Jewell Junction and Ellsworth. Callanan, although a town of many thriving business places, faded out of the picture. Some were moved to Jewell, and others to Ellsworth. All that remins to denote the site of this town, is a slight raise in the land of the farm of that area. is part of the wider map below. You may wish to click to enlarge this 1878 map.